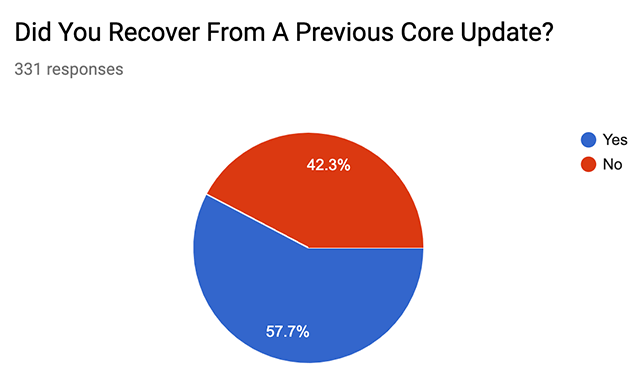 I would not call this a reversal - I would call this an update to the Google core ranking algorithm and thus, with any one who got hit on previously passed core updates, some may see their rankings improve, some may see nothing and some may see it get worse. That is exactly what we have been seeing. When I asked Google if this was a reversal, they didn't say it was. They just said "We're constantly improving our algorithms and build forward to improve." So yea, they didn't reverse anything specific, just continued to make improvements to their algorithms. Of course, by now you probably saw the Sistrix blog post that said "What’s interesting here is that many of the affected domains (75% of this sample) were also affected by the big updates of 2018." I'll have more data from other providers on that on Search Engine Land this morning - plus more details from Google there in the next couple of hours, I hope. Seeing a couple of cases of dramatic recovery on March 12 of sites that were hit hard on August 1st, 2018, but hard to tell if they're anecdotal. Also seeing plenty of sites hit Aug 1 that didn't recover and some that declined more. In short - this was not a simple code revert from Google. Google updates their core search algorithm which has resulted in some sites that were negatively impacted in previous updates to benefit, while others did not.